To all the budding Auspit fans, we know what we can do on the Auspit from one end of the scale to the other, but based on cold beer, fine bourbon, fresh caught trout and a good campfire, we’ve come up with a new one, the finest in smoked trout, which could also be applied to salmon. Remove the head from your freshly caught fish and using the long Auspit spikes, thread the spike from the shoulder end along the backbone and out the tail, and ensure that a small portion of the meaty section is pushed over and around the first 90 degree bend on the spike, and gently rub a small amount of salt or salt spice over the skin of the fish, this also draws out the moisture. 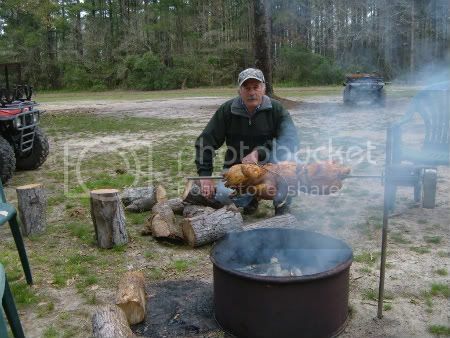 Working with an existing campfire, and/or firetrough application, the principle is to give a small amount of gentle heat and heaps of smoke over an approximate 2 hour period that will delicately smoke the fish. By removing burning logs or coals aside from the main campfire, and snubbing out any flame, the logs will continue to smoulder, producing heaps of smoke to which the fish are placed over the top of your smouldering fire. The logs and coals can be pushed together to retain the burning action but once it converts and ignites back to flame, the fire should be snubbed out immediately by pulling the logs apart to stop any flame action. The smoking process took place over approximately two hours while we were cooking our main meal and discussing the oncoming delicacy that was awaiting us. The same principle would apply to the firetrough, based on small pieces of wood smouldering giving the same effect. Care should be taken as to not generate too much heat and definitely no flame. It is also advised to do this 6ft away from your main seating area, as the smoke can get powerful and also works better with no wind influence, therefore the smoke goes straight up through the fish. Everything looks great!! Can almost smell it. By the way.....what's in the pot?? I was wondering what was in the pot, too! I have to say when I did a trout up in Glacier National Park, I found it a bit tricky. Delicious but tricky. Some friends and I hoofed over two miles up to Avalanche Lake, navigating perilously among cantankerous grizzlies and ravenous deer in order to prepare a lakeside picnic. We converted the cook into a surf and turf affair by throwing on a rack of babybacks along with our one, somewhat meager trout, which we skewered on the main spit. For seasoning on the trout, (partly because we forgot the lemon back in “civilization”) I went with a simple salt, pepper, and a fine trace of my friends's to-die-for Secret Squirrel Rub (which was more generously coated on the ribs). I used lump mesquite charcoal, some briquettes, a sprinkle of apple wood chips and a few big chunks of peach wood in the FireTrough. To keep everything in place, I wrapped and sutured the fish with picture hanging wire. We were all surprised at how fast the fish cooked, especially considering there was a cool breeze and occasional light rain. It took 45 minutes, tops. The wires started cutting into the flesh as it became cooked. At the end it was a precarious state of affairs trying to keep the fish from running away or decapitating itself. We ended up having to stop the motor and holding the fish in place with a big knife blade to finish the cooking without losing it. The next time, I think I would try wrapping the trout in foil belts/slings as it got close to being done. Yes, it was getting dark when we finished up and yes, we high-tailed it out of there before the grizzlies closed in on us and our new eau-de-trout scent which surely permeated everything. Jon, what do you use for coals or wood when you are on one of these treks?? As this was in a National Park, collecting wood at the end of the trail was not an option. We carried up natural hardwood lump charcoal (which is pretty much all I use anyway--it burns hotter and cleaner than Kingsford-type briquettes) and some wood chunks for smoke. This time I believe it was only peach wood. I believe we soaked the chips a bit to get more mileage out of them. From memory, the billy just had the water boiling for a cuppa and the dishes after. Jon, that tucker looks amazing!